If you require manual commenting for individual BW objects, you can create manual, structured object documentation using the BW Object Browser in combination with the integrated “CT-DocuEditor”. For this purpose, more than 20 documentation forms are available for the most common BW objects. The documentation forms have a common structure and facilitate documentation work by providing questions in checklist format. Through the use of documentation forms and checklist templates, it is possible to achieve standardization of the information entered manually. Later evaluation or analysis produces comparable results. Manual comments can be written for all objects that are displayed in the BW Object Browser and in the BW object lists. You can write the comments using the “CT-DocuEditor” (Microsoft Word®-compatible editor) or alternatively directly in Microsoft Word® itself. A special Word template is available for every BW object type supported. Writing of documentation is simplified using checklists. You can adapt the checklists to your internal documentation guidelines. The supplied commenting templates contain questions that our BW consulting practice have shown to be useful. 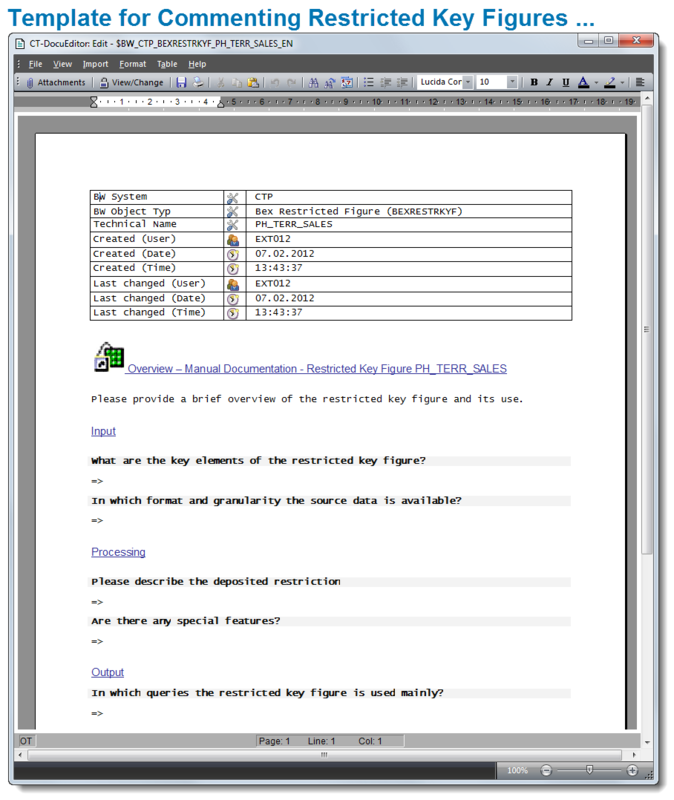 Based on a uniform pattern (per object type), a number of questions are provided; The “form is then filled out” according to a defined structure. You can adapt and structure the templates to meet your particular needs. Advantage: The uniform structure makes later comparison of manual documentation of different objects and by different authors possible/easier.